Dropbox has updated with some new features. Sharing is a bit simpler, with the ability to generate a public link for any file or folder and have it open in a web-based viewer. This can be accomplished both from the website and on the desktop by right clicking and selecting get link. Those using the beta version of the Dropbox desktop client have enjoyed some of these features for sometime, but now the full suite of file viewing and folder sharing options are standard issue for all. SAN FRANCISCO, Calif. - April 23, 2012 - Dropbox, a free service that lets people bring their documents, photos, and videos anywhere and share them easily, today announced an even easier way for people to instantly share the things that matter most, with just a link. Now documents, photos, and videos can be shared simply by creating and sending a link to friends, family, or colleagues, whether they are Dropbox users or not. Dropbox links allow people to easily view documents, photos, and videos in a beautiful full-browser display without any setup. Business presentations, home movies, and even entire folders can be opened and viewed instantly without having to sign in, download anything, or open files separately. From the Dropbox desktop, web, and mobile applications, the "Get link" button generates a unique link to a file or folder. The link can then be quickly sent to another person. 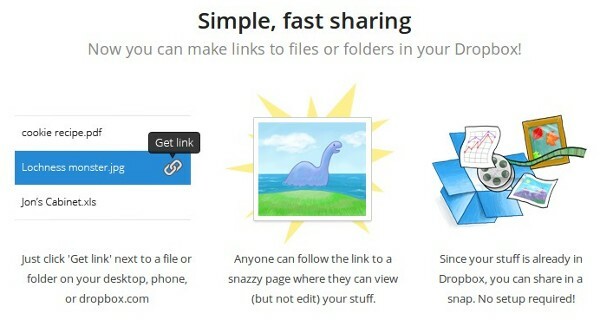 For Dropbox users, opening a link will provide the option to instantly save the file to their Dropbox. "Today we're excited to add instant sharing to Dropbox," said Jeff Bartelma, Director of Products. "We've simplified the process of sending files to just a few seconds and eliminated the need for email attachments." Dropbox has been refining this feature in beta since last year and today, with many improvements, it is available to all users. For more information, please visit www.dropbox.com/links/features. Dropbox simplifies millions of people's lives by letting them bring their docs, photos, and videos anywhere and share them easily. The service has more than 50 million users in over 175 countries. Dropbox was founded in San Francisco in 2007 by Drew Houston and Arash Ferdowsi. For more information, please visit https://www.dropbox.com/press.